Baby Digger loves playing with bubbles! So much, in fact, that every time we go outside she says bubbles, bubbles! So, we have lots of bubble toys for her from Imperial Toy and I was excited when I saw one of their newest toys, the Little Tikes Cozy Coupe Go Bubbles. Imperial Toy Go Bubbles come in three cute styles – Little Tikes Cozy Coupe, Thomas The Tank Engine™ or Disney Princess™ Royal Princess Go Bubbles. We choose the Little Tikes Cozy Coupe because it’s adorable and the cozy coupe is a adorable and classic summer toy. 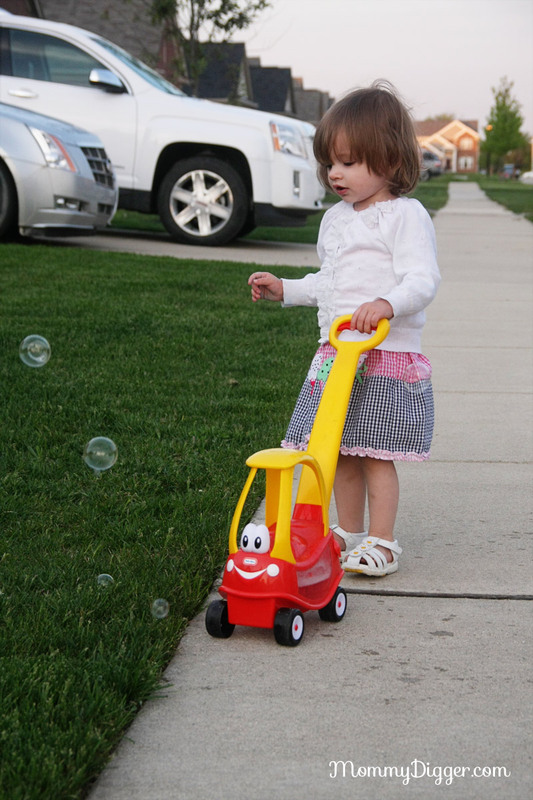 The Little Tike Cozy Coupe Go Bubbles releases a stream of bubbles as your child walks along with it. To make the work and make all the pretty bubbles you just need a couple of AA batteries, fill it with the included Miracle Bubbles and it’s ready to go. To make the bubbles your child squeezes the handle and a trail of bubbles will follow as your child walks along pushing it. Baby Digger is 20 months old and has no trouble getting her Go Bubbles toy to work. It’s a great push toy and bubble toy all-in-one. The only thing I’ve noticed with this toy is that if the batteries aren’t fully charged it doesn’t create as many bubbles so just be sure to have a fresh pair of batteries installed. She has a great time with it and loves all the bubbles that fly around her while she walks along. It’s the first toy she goes for when we go to play outside! Imperial Toys is giving one lucky winner the Little Tikes Cozy Coupe Go Bubbles RV $25. To enter visit my Summer Splash Giveaway and fill out the Rafflecopter form. Ends 5/27 at 11:59 PM EST. I’ve never seen these before – how cute! I just wish it didn’t require batteries..all these toys with batteries kill me! My kids would really enjoy this toy, thanks for the review! Nice giveaway !I’ll try to win this for my charity organization..
How cute! I remember my grandson did have the bubble mower. This is a real cute one too. Wonder if they still sell the mower?